In order to obtain a complete picture of the economic life of an ancient oriental city we must enquire into the nature of its industries, its commerce, and its traffic. Further, if the character of the city is to emerge from this enquiry, when we have established the existing conditions, we must then examine the causes which have brought them about. 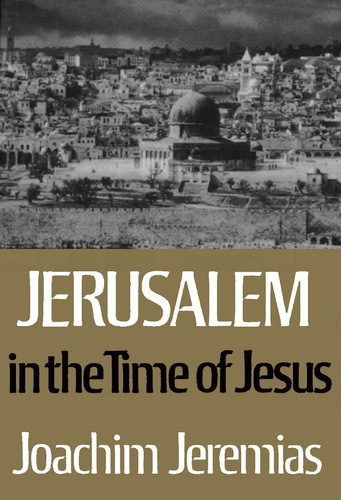 Translated by F. H. and C. H. Cave from the German Jerusalem zur Zeit Jesu 3rd edition published 1962 by Vandenhoeck & Ruprecht Gottingen with author's revisions to 1967. An earlier draft translation was contributed by M . E. Dahl. The typical form of industry of the period was the crafts­man's shop; i.e. the producer owned the means of production, put them to use and sold his products directly to the consumer without intermediary. The crafts were held in high esteem in Judaism at the time: 'He who does not teach his son a craft teaches him brigandage' (b. Kidd. 2ga). We have special evidence in the case of Jerusalem: 'R. Johanan said three things in the name of the men of Jerusalem , . . treat your Sabbath like a week day rather than be dependent upon your fellow men' (b. Pes. 113a and parr.). Theory and practice went to­gether. When M. Eikk. iü.3 describes the entry of the first-fruits into Jerusalem, where the procession was met by the leading priests and Temple officials, special mention is made of the fact that even the craftsmen stood up and greeted the procession as it passed. This was an unusual sign of reverence, for whereas everyone else had to greet scholars by rising to their feet, craftsmen were exempt while engaged in their occupation (b. Kidd, 33a). The high value attributed to craftsmen and their work is above all attested by the fact that most of the scribes of the time plied a trade. Paul, who studied in Jerusalem (Acts 22.3), was a σκψοποιόε (Acts 18.3), a tent-maker (Knopf), or a carpet weaver (Achelis), or a weaver of tent curtains (Leipoldt). A list of the earliest scribes mentioned in the Ta!mud shows the following professions among others: nail maker, flax trader, baker, miller of pearl barley, currier, scrivener, sandal maker, master builder, asphalt merchant, tailor (Bill. II, 745f.